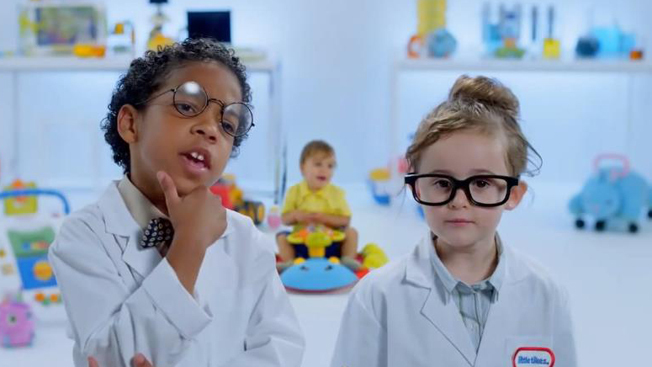 A commercial nearly always has a leg up when it stars preschoolers in suits and wingtips spouting business-world cliches. Throw in hipster glasses, coffee mugs, co-worker trash talk and random firings? Winner! Little Tikes helps kick off the flood of pre-holiday toy advertising over the coming weeks with a faux behind-the-scenes spot, created in-house. The full-length clip below is for online only, with a shorter edit running on TV. Kids run the show at the Little Tikes factory in Ohio, according to the ad, though they're under the watchful eye of the company's CEO. (Insider tip: That's not really MGA Entertainment CEO Isaac Larian, he of the famous $300 million battle with Mattel over the Bratz dolls. It's just some white-haired dude with a posh accent). And kids, of course, come up with the best ideas, including this year's potential hot toys: the ride-on GiddyUp N' Go Pony and fluffy Lil' Blabberz. So parents, you'd best familiarize yourself with these items, if you want to know what to dive for on Black Friday.